Mobile Phone Blank Screen or No LCD Indication Problem and Solution – Learn Solution on How to Solve and Fix Mobile Cell Phone Blank LCD Problem. 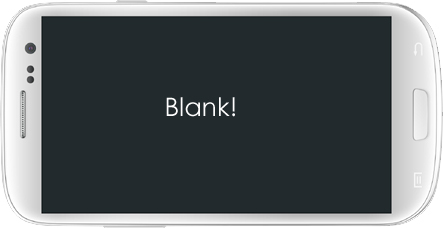 Many times we have observed that suddenly the screen of our mobile phone or smartphone goes blank. Sometimes it happens because the mobile phone is wet for some reason and sometimes the screen becomes blank when the phone is too hot. Here I will explain different reasons as to why the mobile phone screen become blank suddenly and possible solutions. There are situation when a mobile cell phone of any brand including Samsung, Nokia, LG, iPhone, Micromax, China Mobile Phones etc may give problems such as No LCD Indication or Blank LCD. Power ON the Mobile Phone and Check if Sound is coming from the speaker or not. If booting sound comes from the speaker then check the LCD Assembly Status. If the problem is still not solved then upgrade the Software / Operating System (OS) to the latest version. If the problem is not solved then you may have to replace the LCD. The LCD may be damaged. Remember, the LCD screen of modern phones, especially cheaper phones get damaged too quickly and very easily. my phone is suddenly off. when i try to open it cant open, when i connect to charger only show red light ..is. My Samsung mobile model no.SMG-313HU is white screen no graphics problem, when I switch on the mobile normal sound for On the mobile is coming.I buy a new LCD for my mobile but still the same problem,I also try factory recovery hard reset but still not working remain in same I think this is a hardware problem of the motherboard.Is there anybody knows problems of this type. Do you mean that Redmi Note 5 Pro is Dead? Get the Board Checked Thoroughly. Clean the PCB with IPA or Alcohol and Check Back. My Sony C3 fall from height ,it screen is dead ,I don’t know ,it’s has only red notification light ,I know how open the phone ,the screen is working ,but blank its on I can ,it’s it problem with LCD or battery? There could be problem with the Display or the Touchscreen. Remember that the Display and the Touchscreen are two different parts. Check if the Battery is Lose. There can even be Fault at the Battery Connector of the Power Switch. my phone just automatically got off and not showing anything when i try to switch on the phone when i try to charge it no led but the screen gets on and shows the charging sign and the again gets off..please help. my BLU phone has no display in a regular way if the phone is ON like you cannot see the apps icon and other icon , but you can see the display for the network , battery ,network icon at the top of the screen, you can even see the message notification if your phone is in standby mode but once you open to swipe nothing display on the phone. can you help me figure out what is the problem or any solution for this? There seems like problem with the PCB. You may not be able o repair it yourself. Please take your cell phone to authorized service center.